Blue chip stocks are some of the most dependable long-term investments you can make, but what does the term mean? Blue chip stocks are widely considered to be some of the safest and most dependable stocks to invest in due to their size, stability, and ability to absorb bad market conditions. However, many investors don't know exactly what a blue chip stock is. Let's take a look at what makes a stock a blue chip, which stocks qualify, and how to safely incorporate blue chip stocks into your long-term investing strategy. There is no formal cutoff that determines which stocks are blue chips and which ones aren't. Generally, the 30 stocks on the Dow Jones Industrial Average are considered blue chips, as are several other companies that meet certain criteria. They are big companies with reputations of performing well in good times and bad. 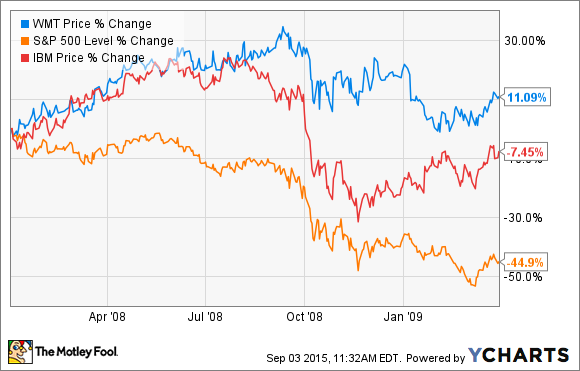 For example, Wal-Mart and IBM handily beat the overall market's performance during the 2008-2009 crash. They have a strong history of dependable earnings growth, and are profitable in any type of economic environment. They typically have a market cap in the billions and are among the largest two or three companies in their business. Usually, blue chips are household names -- it's rare to consider a stock to be a blue chip if most Americans are unfamiliar with the company's business. Again, this is not an exhaustive list, and determining which stocks are blue chips is somewhat a matter of opinion. For example, Apple's business looks pretty bulletproof right now and is definitely among the most recognizable tech companies -- and it's a part of the Dow, but it just recently started paying dividends and its history of performance during crashes and volatility isn't exactly great. So, the answer to whether Apple is a blue chip stock depends on whom you ask. Finally, I want to emphasize the point that even though blue chips tend to handle crashes, corrections, and recessions better than other stocks, that doesn't make them completely immune. Crashes in specific sectors have the potential to wipe out even the strongest companies, as Lehman Brothers' shareholders found out the hard way during the financial crisis. So, although owning a portfolio of high-quality blue chip stocks is a smart move, it's still important to properly diversify and to do your homework before buying any particular company. However, a well-rounded portfolio of blue chips can provide you with the growth potential you want along with the peace of mind that comes with knowing you are well insulated from market corrections.